Cars “made in Germany” are a byword for German engineering skills and cutting edge automotive design. However, Germany’s manufacturers are putting their reputation at risk as they increasingly concentrate on short-term margins at the expense of revolutionary technology and genuine innovation. One cause lies in the frequent failure to call on the wealth of experience gained by suppliers as they contend with changing requirements and processes. 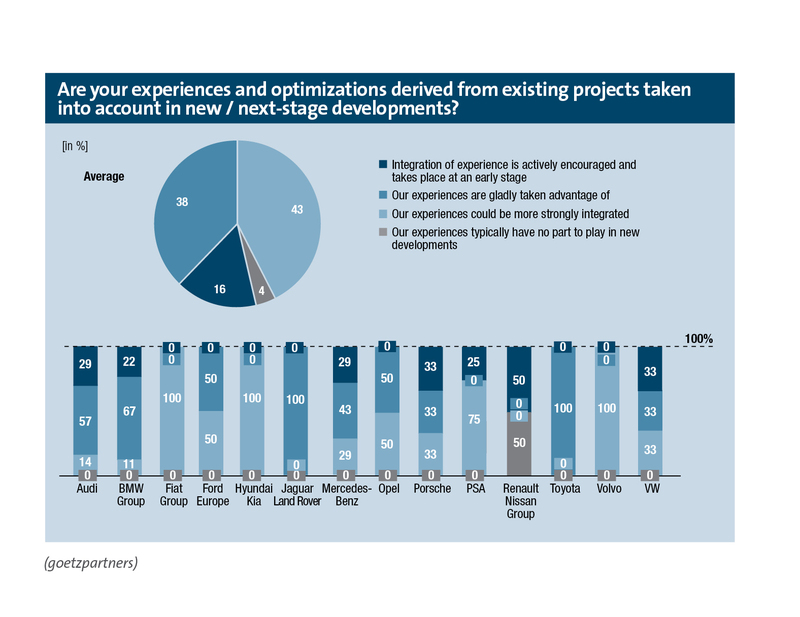 A total of 43 percent of those surveyed believe that their experience could be more strongly integrated into new and next-stage developments, while 4 percent even commented that their experience typically plays no part at all. By the time suppliers are integrated into manufacturers projects, it is often too late. Almost one third (29 percent) of the suppliers who were surveyed consider themselves to be rarely, if ever integrated into manufacturers’ projects in good time. And yet, this is the only way in which their experience can be brought to bear early enough to accelerate the discovery process. You will find specific ratings awarded to individual automobile manufacturers (including all the premium German brands), as well as further weak points in the manufacturer/supplier relationship and recommendations for action in the goetzpartners report. In the course of the study, over 100 experts in the automotive supply business were asked about their cooperation with the automobile manufacturers. You can download the complete study (in German language) HERE.